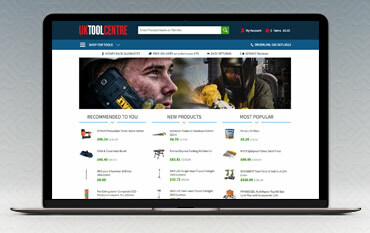 Where do I use my UK Tool Centre voucher code? Add the items to your basket by clicking 'Buy Now'. You can then visit your basket or continue shopping. Once you have added all your items to your basket you will need to visit the basket page to enter your code. You can do this by clicking the basket icon on the top right section of the page. On the Basket page, you will see 'Discount code?'. Click the text to reveal a box. Enter your code here and click update. Your order total will be automatically updated with any discounts received. "Free delivery on orders over £75." "Up to 50% off in the clearance section." UK Tool Centre boasts a huge range of power tools and hand tools for both home DIY use and the trade professional. They strive to provide the best competitive prices and the very best quality tools. UK Tool Centre take pride in their excellent customer service team which hosts a dedicated customer service hotline. Free Delivery for all orders £75 or more, alongside a special offers section which helps you to save money on great products, over 50% off RRP. Using a discount code is a great way to save money on your order. UK Tool Centre offer occasional discount codes. Usually, they will give you a discount on a minimum spend such as "£5 off a spend over £25" or "£10 off a spend over £75" or like "5% off a £60 or more spend". You just need to enter the voucher code at the checkout stage to see an instant reduction to your final bill. Here at Netvouchercodes, we aim to keep you updated on all of the discount codes and money saving deals that are on offer at UK Tool Centre, so don't forget to check here before placing your next order. UK Trade Centre has established good working relationships with the all of the major manufacturers over the past 60 years and so they are in a great position to be able to offer tools and all related products on a supply basis. They regularly deal with organisations like colleges, government departments, estates, shops and all of the trades and are able to provide the most competitive quotes and support. So, if you need to buy in bulk, place regular orders or have a large order to place, get in touch with UK Tool Centre for a quote. Their friendly staff will be happy to help and there is no need to open an account. Whatever power tools you might need to complete your home DIY project or professional job, you are certain to find exactly what you need from the extensive selection available the UK Tool Centre. They offer all types of power tools including drills, saws, planers, nailers, routers and jointers, sanders, paint sprayers, heat guns and so much more from trusted brands such as Bosch, Black & Decker, DeWalt, Milwauki, Hitachi and much more. All tools are offered at great value for money prices saving you ££££s on the recommended retail price. Most tools can be delivered the next day and if you spend the required minimum amount, delivery is free. You can return any product back to UK Tool Centre as long as it's unused and in it's original packaging. UK Tool Centre is an established trusted company, which offers an extensive range of over 10,000 power tools and hand tools for both home DIY use and the professional trade, from all the major brands like Dewalt, Stanley, Bosch, Hitachi, Ryobi and more. Use a UK Tool Centre voucher code today and stock up your toolbox. UK Tool Centre also stock a range of decorating supplies, fixings, accessories, workwear, storage and safety equipment, all at great value prices.